Chick number 3 hatched on the 21st May, watched by a fascinated audience at Whinlatter. Hatch dates then are 18th, 19th and 21st. Although the smallest the chick quickly raised its head and started begging for food before it had properly dried – a good omen for its survival. 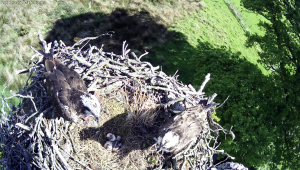 Both KL and Unring have become more synchronised this year in guarding the chicks and one is always close by – although because of their small size they are still vulnerable to the elements. KL has spent the last couple of days shading them from the sun, so they do not de-hydrate. 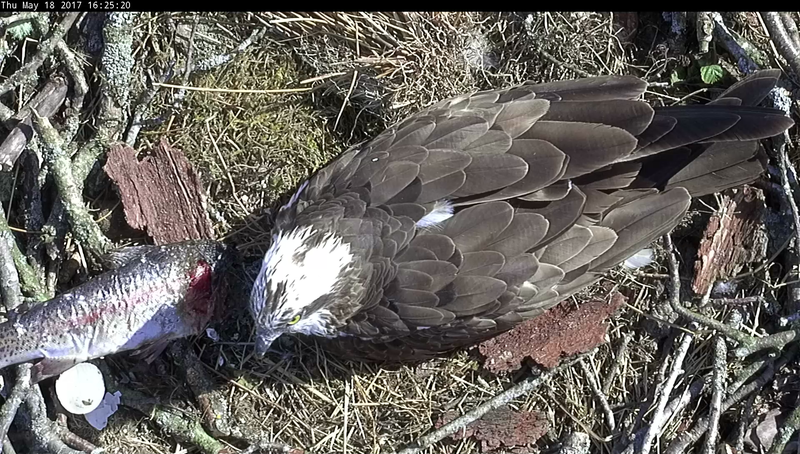 And here is a sibling hatched just about 24 hours after the first. Initially seen at 14.30 on May 19th, Friday after an exciting morning’s viewing following the progress of the hatch from the first chip to first crack to the eventual struggle to get out of the shell. The new little body, despite its gruelling hours escaping from the egg was programmed to respond to the offer of food and had its first mouthfuls whilst it was still damp! The third egg could hatch at any time over the next 4 days according to the dates – no signs today. 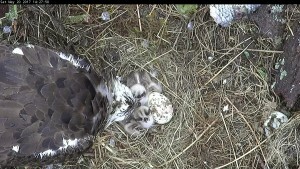 After two days of waiting with baited breath KL and Unring’s first egg DID hatch at last in the afternoon of May 18th. However, for hours all we could see was the empty eggshell – evidence but no content. 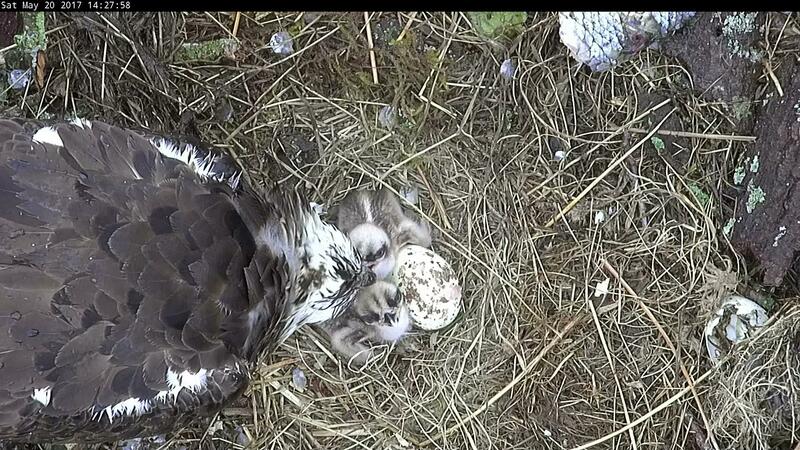 KL seemed determined to keep the chick tucked well in under her feathers. Even the sizeable fish that Unring brought up for the occasion was spurned. At long last we got a good view as Unring came to inspect his offspring and a little later in the evening it was given a first feed. Here is a summary of No 14’s migration from Bioko to the Lakes this year and a run down of where he was in April. On the 22nd March 2017 Number 14 was at his favourite site on the island of Bioko, Equatorial Guinea. He had been here for most of the winter sometimes not travelling more than a square mile away from his favoured spot, an area renowned for plenty of fish. All changed on the 23rd March when the migration bug set in. His mileage and roost sites for the next twenty-three days were as follows: – You can see why we were concerned with his progress in the Algerian desert. 3,700 (approx.) miles later he was resting on the Lune near Hornby, Lancashire. Since the middle of April Number 14 has remained generally in the South Lakes area with a couple of exceptions. On the 17th April, he had a day out over Liverpool, on the 21st to Dunford Bridge, Yorkshire and on the 28th he was over Hawthornthwaite Fell near Blackburn.